Being audited is a stressful affair — and it can feel especially stressful if you know you’ve been compliant. You’ve filled out all the right paperwork and your customs broker has applied all the right tariff codes — what’s gone wrong? If you’ve been selected for a customs audit, there’s no need to panic. You’re not necessarily being singled out for any wrongdoing. The Canadian Border Services Agency (CBSA) uses audits as a way to investigate potential issues, not as an automatic punishment. Canadian customs audits don’t need to be scary and stressful. We’ve created a guide to show you how they work and what to do if you find your company being audited. 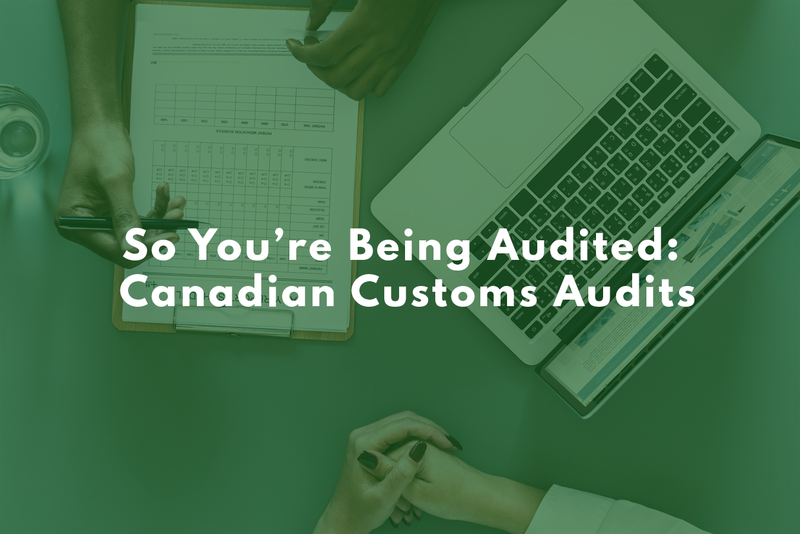 If you’ve been targeted for an audit, it’s likely for one of two reasons: either you’ve been selected for a random spot check, or you’re working with goods that the CBSA has made a priority target. Random verification checks are done throughout the year to encourage voluntary compliance. They may also be performed for risk assessment. If you believe you’ve been fully compliant and the goods you work with aren’t verification targets, it’s likely you’ve been randomly selected. At set points throughout the year, Canadian Border Services Agency (CBSA) identifies imports that it wishes to target for audits and then conducts surveys based on those targets. Goods on the verification priority list are being assessed for tariff classification, valuation, and origin accuracy so that the CBSA can get a comprehensive look at the current status of the selected imports. Multiple rounds of verification may be conducted for the same item if non-compliance in a sector is particularly high. In October of 2018, disposable gloves were added to the list for a fourth-round of audits. As of 2019, disposable gloves have been a verification priority for over six years. Another reason the CBSA would target you for an audit might have to do with suspected wrongdoing, such as tariff misclassification or poor intellectual property controls. This is the kind of audit you don’t want — it’s much harder to pass an audit targeted at your compliance rather than a random check or a verification priority. To make sure you’ve never targeted for potential noncompliance, you should be conducting your own compliance checks regularly. Once you’ve been selected for an audit, you’ll have 30 days to send the CBSA the selected documents. You should do so as soon as possible. Don’t wait until the last possible day to give the CBSA what they need. First, though, make sure you sign the letter of authorization for your customs broker and inform them you’re being audited. Don’t volunteer more information then requested by the CBSA at the beginning stages. If you insist that your operations haven’t changed, that will lead to the agency requesting more information and deepening their audit, not letting you off the hook. The CBSA was created to assess risk, not get to know you personally. Simply send them what they need when requested. As soon as you receive notice you’re being audited, it’s important not to make any additional changes to your records. Even if everything you’re doing is above board, it will look suspicious and could get you into trouble. Finally, once you receive a letter from CBSA with their findings, you have 30 days to provide supplemental information. While you still shouldn’t supply the CBSA with your company’s entire archive — they’re busy! — this is where you can volunteer information that will potentially influence the final decision. Your customs broker can advise you on the best way to proceed. Is the value of your imports being reported properly? Are your goods being classified properly? Is your country of origin correct every time? Being audited is stressful — but with the right preparation and advice, you can get through them. Contact us today for help!